A FEMA friend who works in mass care emailed me recently with her comments about the Mass Care Task Force White Paper. "This is all very interesting," she said, "but none of the states in my Region have the personnel to set up even one of these Task Forces." I saw from her comment that she had failed to grasp a key tenet of the White Paper. No state has the organic capacity to set up one or even multiple mass care task forces in a large disaster: not even Florida. As the White Paper clearly states on page 3, "Additional staff must be requisitioned prior to a Noticed Event or immediately after a No-Notice Event." And people with the necessary skill sets are only available out-of-state. Which is why one of the objectives of the National Mass Care Exercise that we are holding in Tallahassee May 19-22, 2014 is to practice bringing in mass care staff from other states and integrating them into our State mass care operation. This year we are bringing to the Exercise mass care practitioners from multiple states, Femites from multiple Regions, and mass care voluntary agency staff from across the nation. Our Goal is to practice and refine the State Mass Care/Emergency Assistance process that I have outlined in a prior blog. In fact, we have so many people coming we are going to establish 4 mass care task forces for the exercise: Sheltering, Feeding, Distribution of Emergency Supplies and Reunification. A big question for this exercise will be how the State Mass Care Coordinator (that would be me) will be able to coordinate the activities of the 4 Task Forces. 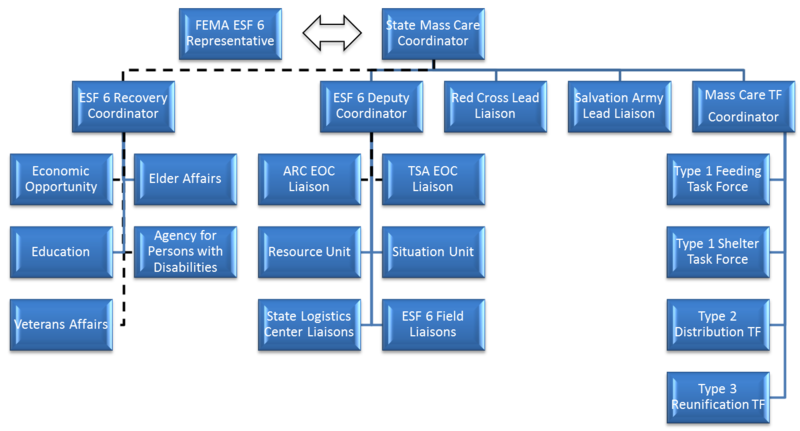 As an experiment, we came up with the organization chart below. This chart is NOT a hierarchy of command but a diagram showing the recommended flow of information (up & down). In modern parlance, the State Mass Care Coordinator only has so much bandwidth. The information flowing to/from the State Mass Care Coordinator must be controlled so that he/she doesn't become overwhelmed. When we expanded to 4 task forces we created a Mass Care Task Force Coordinator position. Yes, we have that power. This new position will manage the flow of information between the SMCC and the 4 Task Force Leaders. We will have to see how it works. As I said when I first showed this chart to the planning team: At the end of the exercise we will be able to say: "Well, at least we now know THAT way doesn't work."